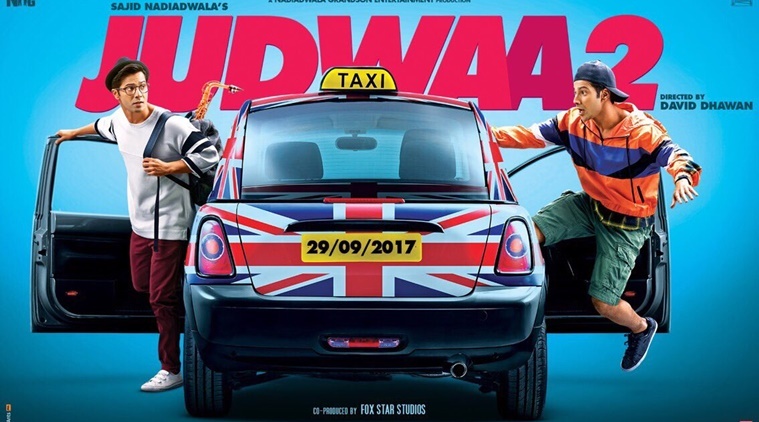 Varun Dhawan who is pretty excited about his double role in his upcoming next, Judwaa released a new poster of the film on the eve of his father David Dhawan’s 65th birthday. “On #Daviddhawan‘s 65th bday here is his 43rd film #Judwaa2. RAJA and PREM Double fun this Dussehra! @foxstarhindi @NGEMovies,” tweeted Dhawan. The new poster shows the twin avatars of Varun as Prem and Raja. The movie has garnered great buzz because the original Judwaa had Salman Khan playing the lead role. While Karisma Kapoor and Rambha played the female leads in Judwaa, the second installment has Tapsee Pannu and Jacqueline Fernandez as actresses. The poster gives out a comic vibe and Judwaa2 loks certain to be a fun ride. Interestingly the taxi in the poster bears the picture of Engalnd’s flag- Union Jack. The trailer of the film is slated to release on 21 August and the movie will open in cinema screens on 29th September. The movie is being presented by Fox Star Studios and Nadiadwala Grandson Entertainment.